We were honored to attend the baptism of sweet baby Behr Ivy James Beatty, the son of my long time friend, Kelly. Attended 9:00am mass at Sacred Heart on Coronado Island with ceremonies during. It was lovely. 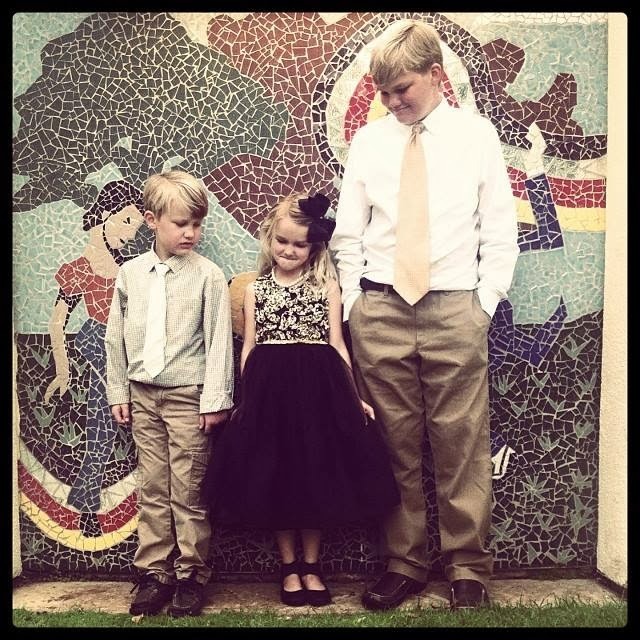 Blake was traveling, so I was in charge of dressing this group and wrangling kids. They did so well. Afterwards, we went back to Kelly's house for a beautiful luncheon. Kelly is a fantastic entertainer and everything is always first class. Magnolia Beau was darling, as always. Big sister! It was such a special day. And, the most exciting part was when Behr had a poopy diaper. All the kids gathered for the show. We're so blessed to have the Beattys in our lives! And, as Behr's Godmother, I have a lifetime ahead of me dedicated to this precious child. I will take this role seriously and cannot wait to share my faith with him as he grows. I feel so lucky! Back soon with beach pics after the party. They're darling. Off now to write. My life currently consists of non-stop writing, Carter's middle school basketball, Jack's Minecraft, and Lainey's fashion love. What a fun day! The punks clean up so well! Great pictures! Kids looked great and you look great with a baby .... how about another little punk? I just saw this post! Love it!! The pics (and punks) are beautiful! P.s. Brian was not present in pics with priest because MB pee'd on him. Thanks for a fabulous day! Oh my - so sweet! Love that babe's reddish hair! So cute! Baptisms are so special - they always make me cry! Looks like a wonderful special day.